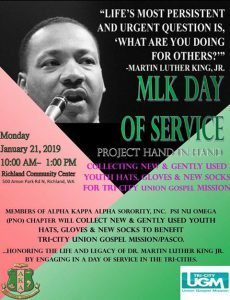 Members of Psi Nu Omega – Alpha Kappa Alpha are collecting gently used hats & gloves and new socks for youth and adults. Donations will benefit the Women & Children’s Shelter at Tri-Cities Union Gospel Mission. We are willing to pickup donations before the event date. Contact Ashley Jenkins – jenkins2arj@gmail.com. 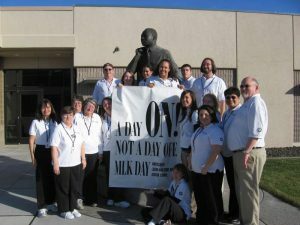 The 28th annual Martin Luther King Jr. Bell-ringing ceremony is scheduled for Monday, January 21, 11 a.m. beginning at the Martin Luther King statue on the CBC Pasco campus. Speakers, music and presentation of the annual Martin Luther King Jr. Spirit Award are also planned. Following the ceremony, refreshments will be provided and AMERICORPS will have games for children. 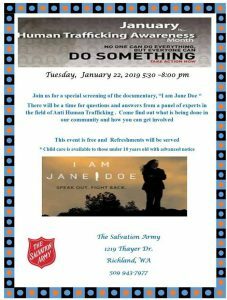 From 5:30 p.m. – 8 p.m.
Join us for a special screening and panel discussion on Human Trafficking Awareness, what is being done in the Tri-Cities to combat it and how you can get involved. 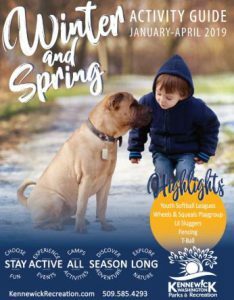 The event is free and child care is available with advanced notice. 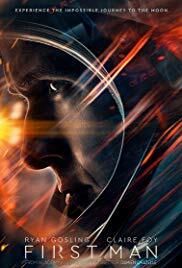 Join us in the planetarium theater for our first ASCBC-sponsored movie of 2019, “First Man”! 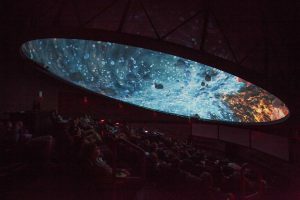 Our forward-facing projector casts a movie theater-sized rectangular screen at the front of our theater, allowing us to show such films on our 36′-wide dome! Seats will fill up fast, so reserve yours now. Doors will open about 30 minutes prior to each show time. 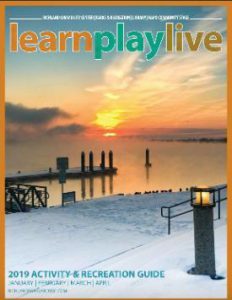 Roy Gephart is an award-winning author with 40 years experience in the environmental sciences and hazardous waste industry. He is a nationally recognized expert on the Hanford Site. His career has focused on geohydrology, risk, information management, and science/policy linkages. He has managed applied technology to basic research programs. Roy is an information resource with local to national news media and a variety of agencies on environmental issues. He has written some 50 publications including two award winning books on Hanford waste management history and environment cleanup. Roy has given numerous invited lectures across the nation. He has been involved in several public-focused science education outreach activities. 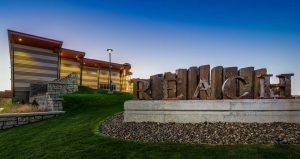 Future dates: Jan 31, Feb 1 & Feb 2 at 7 p.m., Feb 2 at 2 p.m.
Tri-City Court Club, REI Kennewick, Dean Olin, The Rock Climbing Guide, and Inter-Mountain Alpine Club (IMAC) proudly present Reel Rock 13. 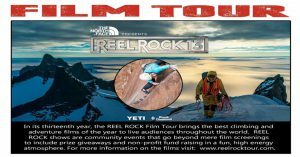 In its thirteenth year, the REEL ROCK Film Tour brings the best climbing and adventure films of the year to live audiences throughout the world. The latest Reel Rock offering features footage of some of the best rock climbers and mountaineers around, including Alex Honnold, star of “Free Solo.” All proceeds will be donated to Inter Mountain Alpine Club! Friday from Noon – 8 p.m.
Tri-City Families are Out of This World! 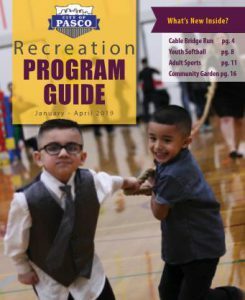 Join us at the 2019 Family Expo where our community comes together to provide fun, educational and interactive activities and entertainment for Tri-City Families. 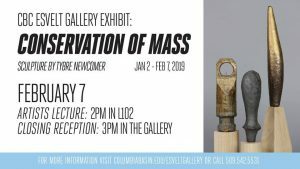 Featured exhibit: the Pasco Aviation Museum will have an interactive exhibit commemorating the 50th anniversary of the Apollo 11 mission and the first moon landing as well as additional exhibits about local aviation history. Join us! 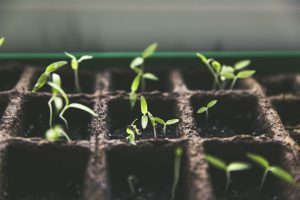 Do you want to start plants for your garden this Spring? Admission: Adult $10, Kids 5-12 years old $6. Tickets can be purchased at the door. The 2019 TCCAA Chinese New Year Celebration is the biggest event of the year for the Chinese community in Tri-Cities and has become a signature event around the area. 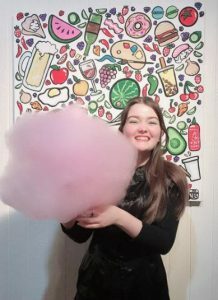 There will be traditional Chinese cultural performances, as well as Chinese calligraphy exhibition and some interactive activities for all participants to experience the culture and enjoy the atmosphere of Chinese New Year. 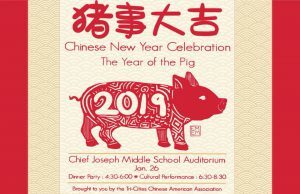 There will be a Chinese New Year Dinner Party at 4:30 p.m., and the reception and performances will start at 6:30 p.m. Lesson begins at 7:00 p.m. with called contra dances starting around 7:30 p.m.
Three Rivers Contra Dance hosts a fun, social dance the fourth Saturday of the month. Contra dance is called to Live Music and taught as you go. 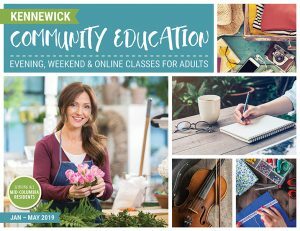 Beginners welcome and no partners necessary! 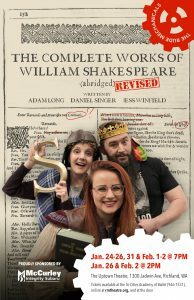 Admission: Patrons receive priority seating – after 7:15, members of the public and patrons are admitted on a first-come, first-seated basis. 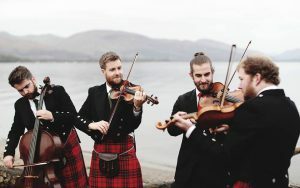 Maxwell Quartet is a string quartet from Scotland and will be presenting Haydn, Beethoven and “The Rolling Waves,” a set of Scottish folk music. 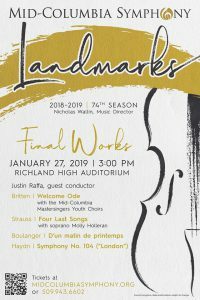 Our first concert of 2019, “Final Works,” will feature the last scores written by some brilliant composers, just prior to their death. The incredibly dynamic Justin Raffa, Artistic Director of the Mid-Columbia Mastersingers, will join the Mid-Columbia Symphony as guest conductor. 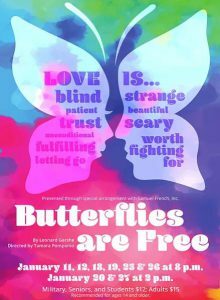 This must-see performance will also spotlight guest soloist soprano Molly Holleran and the voices of the Mid-Columbia Mastersingers Youth Choirs! 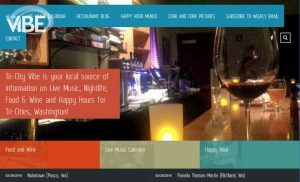 – January 25: Planet Nine at 7 p.m. and Dynamic Earth at 8 p.m.
– January 26: The Zula Patrol: Under the Weather at 2 p.m. and Kaluoka’hina: The Enchanted Reef at 3 p.m.